New Year’s Eve overwatching the fireworks in spectacular Sydney Harbour. Must-see attractions close to your Liverpool Street accommodation You couldn’t be better placed to explore Sydney than at World Tower. When you’re not taking in the sweeping city views from your Liverpool Street suite, you can step out into the vibrant streets of the CBD. You’re less than a 10 minute walk away from the iconic ANZAC Memorial and Hyde Park for an afternoon of peace and reflection. Nearby, the Australian Museum offers an enthralling exploration into the history of the city and beyond: from Australia’s rich Indigenous heritage to the recent events that helped shape the nation. While you’re staying in the area, you must also catch a ballet or theatrical production at Capitol Theatre. It’s an easy walk from your suite to see the best from West End and Broadway, and you’ll find plenty of fine bars and dining options along the way before the show. Burger Project, World Square 11.06/644 George St (1 minute walk) If you’ve just arrived in town and are feeling ravenous, then seek out one of the best burgers in Sydney at Neil Perry’s Burger Project. This trendy spot boasts mouth-watering Cape Grim beef patties and house-made ice cream, hailing from the same team behind Rockpool Bar & Grill. Diethnes Greek Restaurant, 336 Pitt St (2 minute walk) Lovers of Greek and Mediterranean fare can’t miss Diethnes Greek Restaurant which has been a local institution since 1952. Step inside the welcoming ambience and feast on lovingly prepared slow cooked lamb, fresh grilled octopus and perfect moussaka. Nel Restaurant, 75 Wentworth Ave (8 minute walk) For a special night out, get your best threads on and head out for a night at Nel. The degustation menu here changes every six weeks so you can experience eight courses of stunning seasonal cuisine with optional matched wines. A decadent meal full of surprising delights is guaranteed. Assembly Bar, 488 Kent St (4 minute walk) When you’re in the mood for a cocktail in a cosy setting, then amble over to Assembly Bar and find a seat within its low-lit atmosphere. This tucked-away bar offers some seriously good whiskey and spirits, wood fired pizzas, and drinks to share served in skull jars that are smouldering with dry ice. 3 Wise Monkeys, 555 George St (1 minute walk) Chasing some high-quality pub grub? There’s always something interesting happening at 3 Wise Monkeys, from live DJ sets to live sports coverage over three levels – plus, it’s an easy stroll back to your suite at the end of the night. World Square Shopping Centre, George St (1 minute walk) An array of Australian and global fashion, from Lorna Jane and Cue to Calvin Klein and Hugo Boss. Pitt Street Mall, 182 Pitt St (10 minute walk) Discover an abundance of big international names, including Zara, H&M, Topshop and Sephora. Westfield Sydney, Pitt St & Market St (9 minute walk) Snap up local designer goods from Camilla & Marc, Tigerlily, Sass & Bide and more. 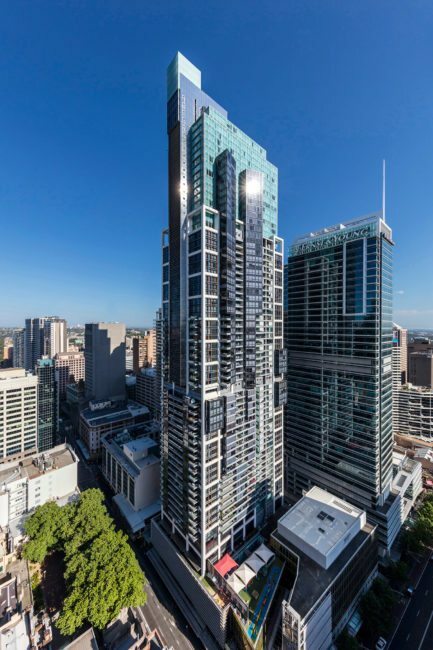 Journey: A 30-40 minute trip from Sydney Airport (Domestic) to Meriton Suites World Tower. Journey: A 20-25 minute trip from Sydney Airport (Domestic) to Meriton Suites World Tower. Journey: A 19-20 minute trip from Sydney Airport (Domestic) to Town Hall Station, then a 5 minute walk to Meriton Suites World Tower. Alternatively, call our friendly reception staff at the World Tower front desk at any time of the day, and we will be happy to help arrange the best transport option for you.